With crewboats coming in so many different shapes and sizes, it is not surprising that the number of permutations possible with the available choice of engines from multiple manufacturers and methods of final drive is quite extensive. At the larger end of the scale, where fast supply boats may have subsidiary roles such as fire-fighting or oil dispersing and carry cargo as well as passengers, it is their speed of up to 30 knots that marks them out from platform supply vessels that average little more than half of that. Smaller vessels may not always be capable of the same secondary roles, but they are rarely compromised in the speed department. Crewboats are relatively long-lived vessels and, in the offshore oil and gas sectors, they tend to be used more when rigs are closer to shore with longer trips made by helicopter. The fact that so many rigs have been laid up over the last 18 months has limited the need for new crewboats in the US where there has traditionally been strong demand, although that has not dramatically impacted upon the dominant position that US enginemakers Caterpillar and Cummins have in the sector. A notable development in US crewboat building has been the growing interest in waterjet propulsion especially in the larger fast supply sector. 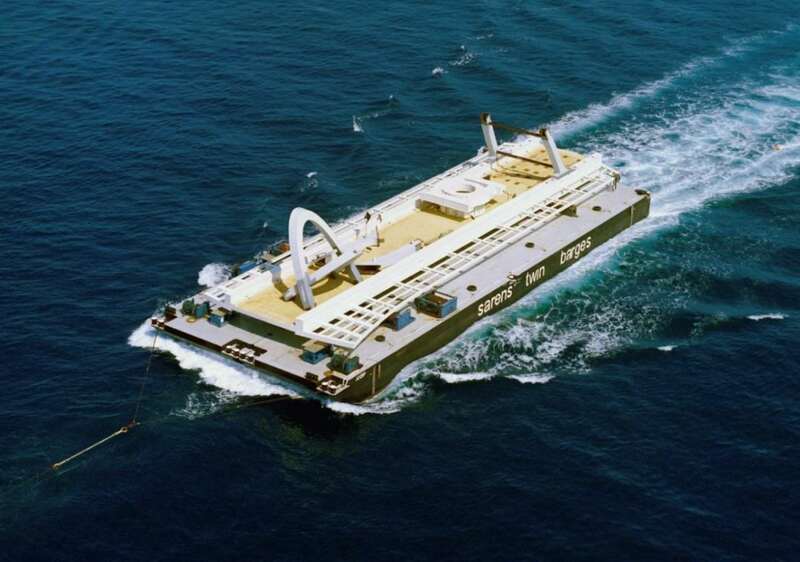 Waterjet-powered vessels are still in the minority overall with only about one in six boats built worldwide having that particular form of propulsion. Through its various offices, Hamilton Jet has achieved a dominant position in the market. While growing in popularity, waterjet propulsion has a long way to go to catch up with the ubiquitous choice of three or four Caterpillar or Cummins engines attached through a gearbox to either fixed-pitch or controllable-pitch propellers. The attraction of waterjets compared to more conventional forms of propulsion is their ability to allow higher speeds and an increase in manoeuvrability. Speed and lack of vibration are arguably the main reasons for choosing jets because, typically, a jet propulsion system is significantly more expensive in capital outlay and, according to some specialists, a conventional propeller allows for better performance when vessels are heavily loaded. Offsetting the extra expense involved with installing jets is the fact that rudders and shaftlines are not necessary and maintenance costs can be lower. Some recent examples of the type are Seacor Marine’s Alya McCall delivered last October and SeaTran Marine’s Mr Steven delivered some months earlier. 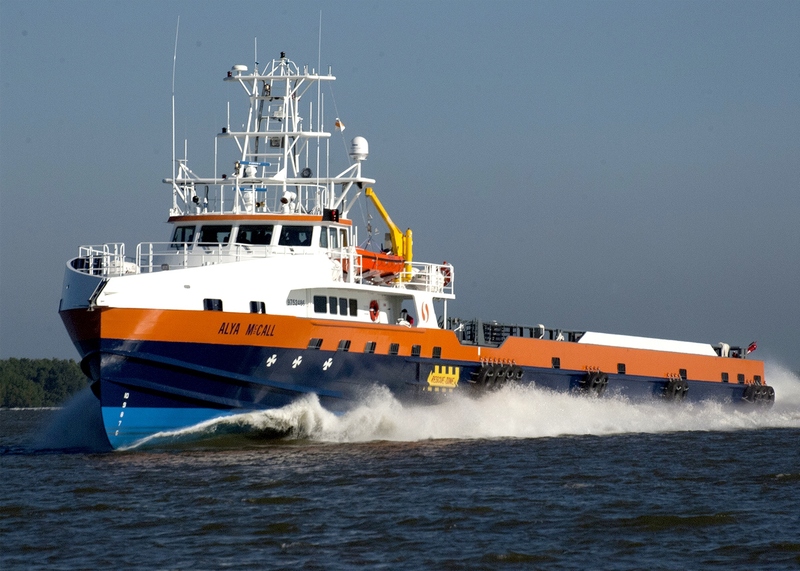 Alya McCall is the first vessel in a fleet of a new class of Incat Crowther-designed monohull fast support vessels being built by Gulf Craft in Franklin, Louisiana. Sister vessel Najla McCall is due for imminent delivery to be followed by Ava J McCall and Liam J McCall later this year. 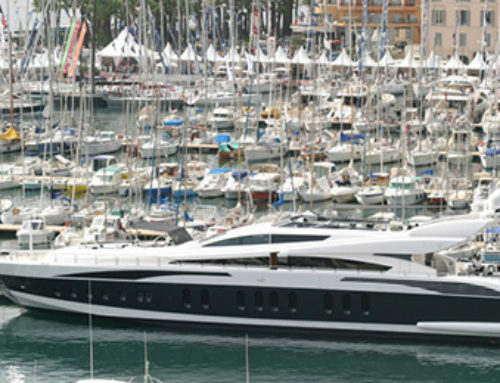 The series has been built for speed as evidenced by the choice of five main propulsion engines – unmatched by any other vessels afloat or planned beyond a smaller pair from 2010 also owned by Seacor. All of the vessels feature the same power and propulsion set-up that gives a maximum light ship speed of 38 knots. The main engines are five EPA Tier 3-compliant Cummins QSK60 types each capable of pushing out 2,700 bhp (2,013kW) at 1,900 rpm for a total power output of 13,500 bhp. Each engine is fitted with a Twin Disc MGX-61500SC reduction gear with a ratio of 2.56:1 and a Hamilton HT810 waterjet. A cardan shafting system by Driveline Service of Portland connects the gearboxes to the waterjets. A Naiad Dynamics ride control system is also fitted to improve passenger and crew comfort while underway. The main propulsion system is complemented by a combination of three Thrustmaster 30TT200 electric-mechanical tunnel thrusters working in conjunction with azimuth-like waterjets, all of which are controlled by a Kongsberg DP-2 dynamic positioning system. Electrical power is derived from three Cummins QSM11 gensets, each producing 290 ekW. By way of comparison, SeaTran Marine’s Mr Steven, also built by Gulf Craft, is, at 32 knots, slightly slower than the Seacor boats but has one fewer main engine. 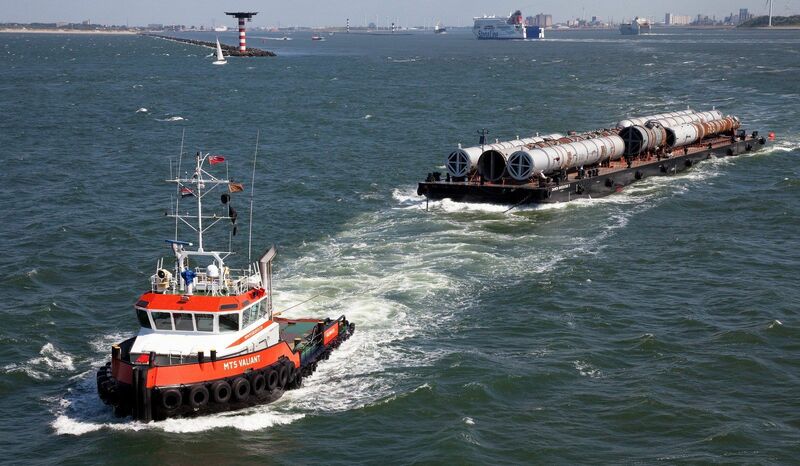 The vessel has the same gears and waterjets but the propulsion choice was for a quartet of Caterpillar 3516C-HD engines. The Caterpillar 3512 and 3516 engines have been popular in many types of offshore vessels in diesel-electric and direct-drive configurations, but as far as crewboats go, the C32 has been the more usual choice. That SeaTrans opted for the new engine as opposed to the Cummins QSK60 it selected for the earlier sistership Captain Elliot is interesting and will allow a good opportunity for comparing the merits of each. Although Cummins QSK engines are mostly specified, its older KTA38 and KTA50 engines are still popular with some Asian builders and operators, which, combined with the dominance of the newer QSK series and Caterpillar’s offerings, leaves little room for the smaller makers at the present time. MTU is arguably the largest of the smaller players followed closely by Moteurs Baudouin. Whereas the former’s engines may be matched with almost any form of final drive, the French engines tend to be mostly used in conventional fixed-pitch propeller situations. Yanmar has been supplying a regular stream of its 12AYM-WET engines, which can produce up to 1,220kW at 1,900 rpm, to yards across Asia including Strategic Marine’s yards in Singapore and Vietnam and also at Mandovi Dry Docks in Goa. 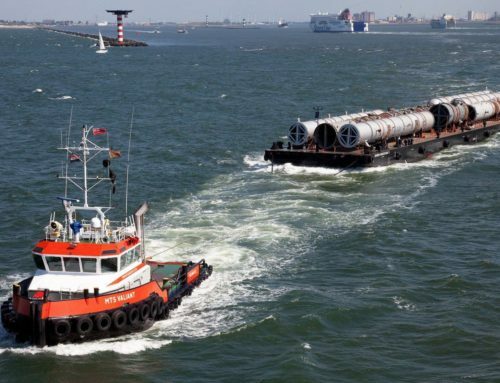 A new market for some vessel builders and propulsion systems is opening up in offshore wind, but needs there are changing as new windfarms are planned further and further offshore. Instead of taking few technicians from an onshore base, the future may well require the crewboats to operate from offshore accommodation platforms and ships. Strategic Marine has also been active in this sector and has developed a specialist vessel the StratCat26 that has found favour with one operator – UK-based Njord Offshore. The first of the vessels, Njord Odin, was delivered in April 2015, with the sisterships Njord Freyr, Njord Magni and Njord Thor all being delivered by November 2015. 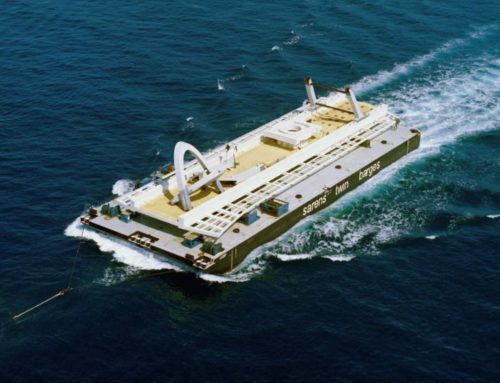 The design name includes references to the class being catamarans with the 26 representing both the length and the service speed although in light ship condition maximum speed is 32kt. The propulsion system of the four vessels features a quartet of Volvo Penta D13C4-AMP engines each attached to a Volvo Inboard Performance System (IPS) podded contra-rotating propeller. The four-system configuration gives the vessels a high degree of redundancy and allows for a DP2 capability. The IPS is an unusual choice for commercial vessels and represents a first in fast crewboats. Volvo Penta developed the IPS as an alternative to traditional inboard shafts and claims it gives superior performance to inboard shafts in every aspect – handling, onboard comfort and performance. The engine drives the two contra-rotating propellers placed at the forward end of the azimuthing pod with the exhaust from the engines fed through the pod into the sea. 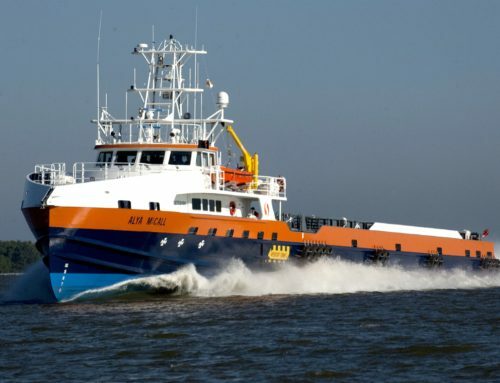 Wärtsilä is notable by its absence from the fast crewboat sector, but MAN does have a toehold with its D2862 LE, again within the offshore wind sector where several recent vessels have the engine coupled with waterjets. The latest of these is the 27.5 knot Rix Leopard, which is due to become operational in May this year after being launched at the Piriou yard in Vietnam in December. Rix Leopard is a Nigel Gee design 27m catamaran that features two of the D2862 LE engines, each attached to a Hamilton HM651 waterjet through a two-speed Reintjes ZWVS 440/1 gearbox. Total power output is 1,029kW.